Picture this; durable sustainably made jewelry with your favorite trail etched into the stainless steel. A charm bracelet or earrings shining in the sun, as a reminder of your active triumphs and adventures. These are Tarma Designs. 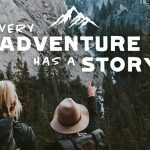 Welcome to the Tarma blog, where you’ll experience the spirit of adventure and resources for how to “love the active life” every day! Tarma Designs creates, designs, and sells jewelry that celebrates a passion for recreation and the great outdoors. Our distinct pieces are made from materials of the highest quality; while remaining socially responsible. We recognize (and appreciate) that every person’s life journey is exquisitely personal, so we offer many options that represent a variety of interests. It is our hope that you find and wear the designs that most align with your passions and individuality. The Tarma Team is currently seeking stories from our customers and wholesalers to share on our blog. We would love to hear how you discovered Tarma, what your favorite designs are, the different places you’ve traveled with Tarma jewelry and anything else you’d like to share about yourself! Tell us your story using the link below for a chance to get featured on the blog and social media. We can’t wait to hear from you!